Learning the alphabet has never, ever been so much fun! The tone and the rhythm of this picture book makes it fun for children and adults alike. The brightness of the pictures and the easiness of the words have you making a sort of rap-like sound to the words. The alphabet seem to be in a tree and CHICKA CHICKA BOOM BOOM, you can't knock them down! Both Rebecca and Lily adored this book and I'm so glad that I found it when Rebecca was younger. Bill Martin, Jr. is also famous for his BROWN BEAR, BROWN BEAR, WHAT DO YOU SEE. He's always the number one picture book author and illustrator that I go to when at the library. my oldest loved this book! I'd say it's a must read for pre-schoolers! Brown Bear, Brown Bear is also a fav or mine :) My 2 yr old searches for the blue horse everytime he picks up the book. Yup, we love this one as well. A playgroup that we used to go to had a stuffed tree with all velcro letters that would stick to it. So cool! It's definitely a classic! Kids in my library love it. 1. i dressed up as the chicka chicka tree for halloween a few years ago!!! it was so much fun! 2. you need to find & watch the weston woods DVD for this book. its incredible. I loved this book when I was little, and so did most of my friends. 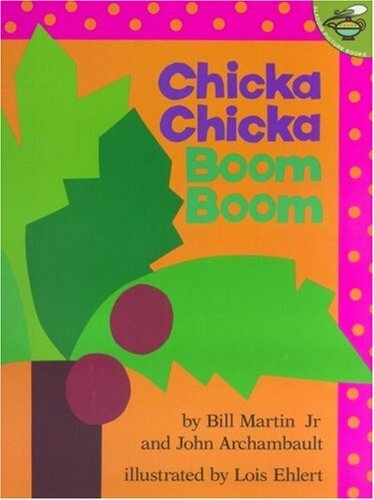 In fact, sometimes someone will randomly say "Chicka Chicka boom boom" and someone else will inevitably call back, "will there be enough room".